I love this outfit!! I love the red trousers with the black and white stripped shirt! And to think you thrifted these make me jealous, lol!! I haven't been fortunate enough to come across any. Red wide leg trousers are a MUST HAVE for me, and since I haven't been able to find any at the price I wish to pay right now, I asked my mom to make some for me! :-) It's great to have a mom that can sew and sew very well. I sew a little, but not as well as she does!! Now I just need to get the pattern and clothe so she can make them!! LOL!! 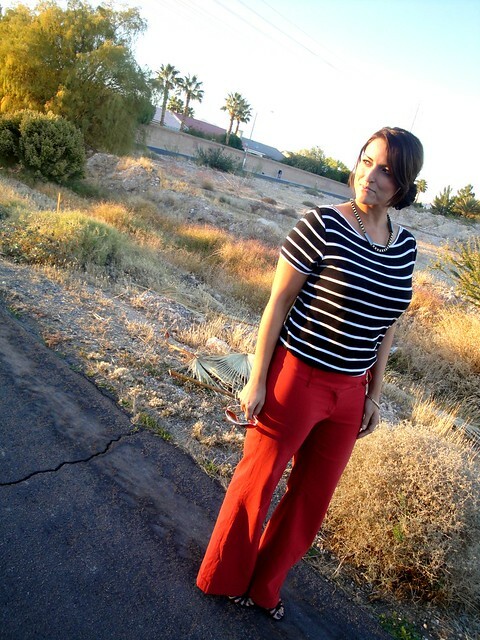 These are great trousers, Shana - and I love the nautical look with the striped top. I hardly ever wear pants, except for jeans, but you are inspiring me! i think "trouser" fit jeans, pants, etc are all more of a flattering cut on every body type, i need to get more like that. i love the red pants, bold and sassy!! and i tooooo miss youuuuuuuu, i don't know how things have gotten so hectic in my life, but they have so i still read all your entries, albeit late at night on my phone or early in the morning, but i do read and see how awesomely fabulous you always look, i just don't always have time to comment, but don't worry...i still be stalkin' u guuuurl! LOL! I have the same problem with pants... although I'm not super tall, 5'6", I have long legs, so they never are long enough and tall is too long! You're wearing pants your way, nothing boring here :) Holy moly red looks freakin amazing on you! If I would have pants like that, I would wear them! I am on a red pant hunt right now, but no luck yet. I like the way you paired it with the striped top, and I love the shoes! You have some cool shoes! you wear the pants and you wore it so well, I like your red pants, it's fabulous. Pairing it with a blue striped top makes you look parisian chic! Cute pants!!! And great pictures, where are you? So jealous. Love colored pants these days! Those pants are perfect with stripes. Such an amazing find! Great red pants girl! I am debating buying some from Asos now. I love your new videos - If I haven't already I'm going to add your channel to my recommended list on YouTube. I love those red pants! And you can't ever go wrong with black and white stripes! I adore red pants. I wore mine yeterday! You look fabulous as usual. I love your P.E. 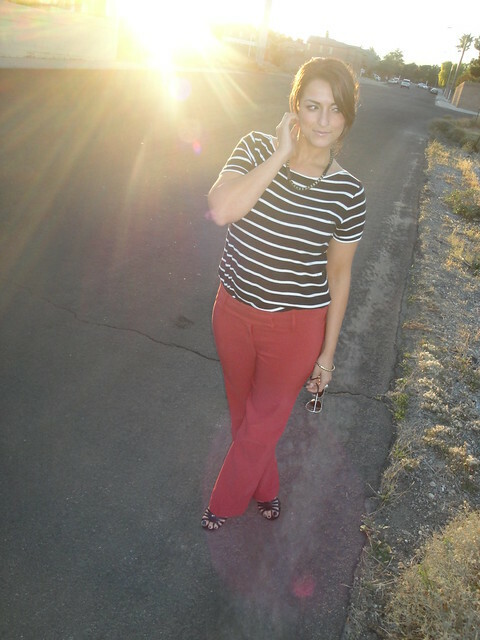 (and that she refers to herself as such) and I love your thrifted red pants-amazing! I'm not a big pants gal either but sometimes I'm feeling a good pair of trousers! Great pants. I'm usually trying to get out of them, but these are super cute. it is official...if I don't own red pants soon I am going to DIE...ok, not really. 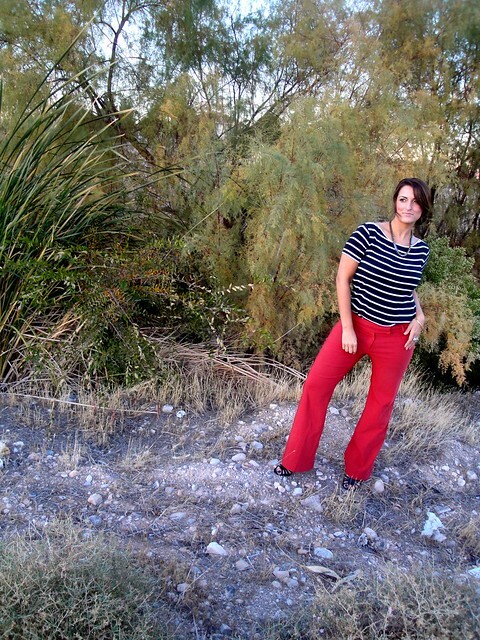 I am just always jealous of all my blogger buddies fabulous red pants. I LOVE you girls!! 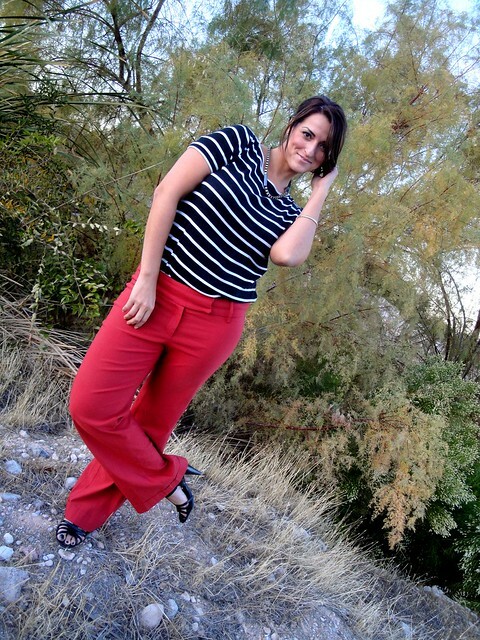 your red/black stripes gave me and idea for new red pants:) Cool video keep posting them!! I love everything about this look. Reminds me how much I need a pair of read pants! Love the stripes and happy to see you're enjoying jewelmint. I like it too. Love the pants! I have been looking for a red pair for the longest.